SJCC member Brian Gillis gave us a talk on his work in the KV to make it safer and more enjoyable for cyclists and we decided get on board to support his presentation to town councils coming later this winter. Great work Brian! 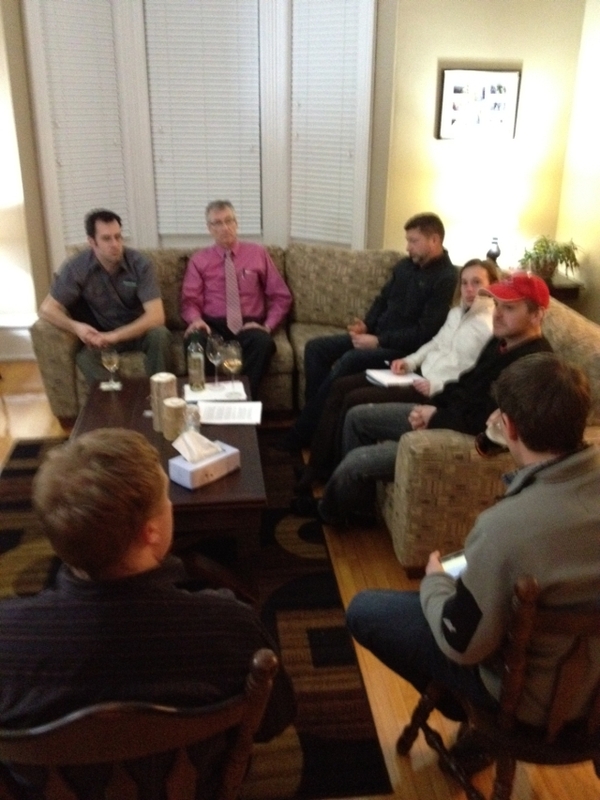 As well we discussed PlaySJ and it’s potential impact and benefits to bike recreation in our city. We have a feeling that 2012 is going to a growth year for bike lanes, routes and trails so get your bikes ready to roll! GRAND BAY-WESTFIELD – Holly McKay is not wishing for a white Christmas. The Grand Bay-Westfield resident knows as soon as the snow hits it will mark the end of her cycling season which has been extended due to the recent bout of mild weather. Holly McKay is still commuting by bike from her home in Grand Bay-Westfield to work in uptown Saint John. Every morning, McKay leaves her home in the suburbs at 6:30 a.m. She hops on her black, dirt-covered Kona commuter bike and heads to work in uptown Saint John. The round trip takes approximately two and a half hours to complete. Her husband thinks it might be time for an intervention, she said. But McKay, a graphic designer for Xerox, refuses to give up and vows to keep her new found transportation going until the bad weather forces her to go back to taking the bus. She has been bundling up with sweaters and ski pants to brave the cold. “I’m trying to squeeze as much out of the season as I can,” she said. Since McKay started cycling last March, the 37-year-old mother of two has lost approximately nine kilograms. She remembered how much she enjoyed biking when she was a kid so she decided to look for a bike on Kijiji, where she found one that a former Bike Works employee was selling. “I didn’t expect that it would be something I would be really interested in,” McKay said. Now, she cycles nearly five days a week and said that it has not only been good for her physical health, but has also been very therapeutic. She said cycling takes the stress out of the daily commute. She said biking to and from work can actually be quicker than taking the bus. She would often wait 45 to 50 minutes to catch the Comex bus to Grand Bay and didn’t get home until shortly after 6 p.m. most nights. By cycling, McKay said she usually gets home at 5:30 p.m. which affords her a little more time to spend with her family. But biking in high-traffic areas can pose some problems for cyclists. Though there are a few bike lanes in Saint John, the rest of the trip can be a bit of a struggle. “Sometimes (cars) will cut you off. I have to use my brakes a lot. If you were in a car, they wouldn’t do that. But because you’re on a bike and you’re going a bit slower, they do,” she said. Some roads aren’t in very good shape and she has to watch for crumbling asphalt and potholes. She says overall, the challenges are relatively minimal. McKay said she is grateful for every extra day she gets but knows that her cycling days are numbered. McKay has a backup plan for when the snow finally forces her off the road. She recently purchased a recumbent bike so she can get her cycling fix in the comfort of her own home. QUISPAMSIS – The Town of Quispamsis has erected 125 new road signs to promote safety and a more active lifestyle. New signs, such as this one on Meenan’s Cove Road, are letting people know to share the road. The signs, which cost a total of $29,000, include a big Q with the spokes of a bicycle wheel, and the words “shared route” or “trail” below. Mayor Murray Driscoll said the signs are part of the town’s broader active transportation plan, which will eventually include the installation of more trails and bike lanes. With cyclists, joggers and dog-walkers sharing the roads with motorists, Driscoll said it’s important to remind drivers to slow down. “It’s all part of a plan of encouraging people to be moving and up and about,” he said, adding the town already encourages activity with the walking track at the qplex and free public skating at both the qplex and the Quispamsis Memorial Arena. Pamphlets explaining the initiative were mailed out to residents, said Dana Purton Dickson, the town’s community services director, who also provided the cost figures. The signs have been installed during the past week, she said. There are a total of 75 signs on the roads and 50 trail signs, located where trails and streets meet. The next part of the active transportation plan will include road markings to make drivers aware of shared-use routes. The markings, which the town calls “sharrows” include an image of a bicycle with forward-pointing arrows above it. Driscoll said active transportation is all part of making Quispamsis a desirable community to live. “If you’re active we know your health is better. And wellness is better. So it’s our way of promoting and trying to encourage a lifestyle where people are kept moving,” he said. SAINT JOHN – Green Feet, the Environment Committee for Uptown Saint John Inc., has completed phase one of its uptown bike parking initiative. Happinez, Princess Street – wine glass shape. The end of this phase brings five new bike racks to the streets of uptown Saint John. The bike racks were a result of a partnership between Green Feet, the Saint John Parking Commission and uptown businesses. The partnership offered businesses the opportunity to brand bike racks to their business or district. Fifteen businesses signed up for the opportunity. The first five bike racks are at the following locations: ACAP Saint John, Germain Street, American eel shaped bike rack; Happinez, Princess Street, wine glass shape; Java Moose, Prince William, coffee cup shape; Rotary Club, upper King St., bike shape with logo in wheel (rack sponsored by Keith Brideau); Gilbert McGloan Gillis, lower King St., bike shape with logo on crossbar and in wheel. The racks are intended to raise the profile of both cycling and the uptown businesses as active transportation champions. Active Transportation Saint John had final say over functionality of the racks, the city’s heritage board signed off on the finish, and the businesses chose the design. 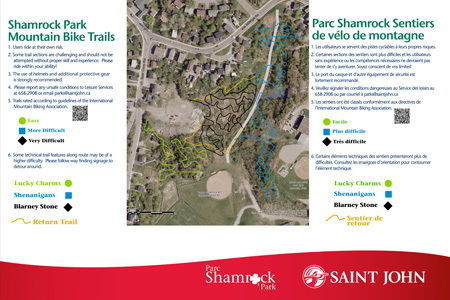 Take a guided tour of the trails. Learn about proper equipment and get tips on how to handle the drops, tables and other features of the new mountain bike trails. From 1 to 3 p.m. Parking lot off Spar Cove Road. The Main Street bike lane will be removed on October 26, 2011 for the winter months, with plans to reinstate the bike lane in the spring for the 2012 construction season. Crews will be on Main Street removing the bike lane pylons, road markings and traffic lights. The concrete jersey barriers at the intersection of Portland and Main Streets will remain over the winter. There is no left turn from Main Street to Portland Street. For more information, please contact Municipal Operations at 658-4455. Map of Uptown SJ bike racks – work in progress….